During the past two years, our Toronto Climbers team has raised over $118,000 for Make-A-Wish® Rope for Hope, setting a high standard for our 2019 campaign. This year we are indeed gathering our courage and teaming up to rappel down from great heights, to help grant the wishes of children living with life-threatening medical conditions. We've set ourselves a new goal of $40,000 this year, which we hope to increase as the 2019 campaign unfolds! A wish come true helps children feel stronger, more energetic, more willing and able to battle their life-threatening medical condition. For many of them, it marks a turning point in their fight against their illnesses. You can make a difference too, by supporting Make-A-Wish Rope for Hope and helping the Foundation continue to create powerful wish experiences, improving a child’s state of mind, replacing fear with happiness and helping them to feel like a normal kid again. 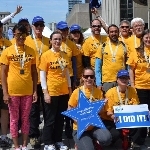 Please register for Make-A-Wish Rope for Hope as a member of the Toronto Climbers team, or if you can't join us for the rappel, please support us by donating on behalf of one or more of our team members! To learn more about Make-A-Wish® please visit www.makeawish.ca. Thank you!